Move your body for balance and turning. Your crew weight can play a big part in boat performance, especially in lighter air and on smaller, lighter boats. Therefore, if you want to get the most our of your boat, don�t be a slug. Move your body around to make the boat turn, minimize drag, reduce pitching and get the right amount of helm. It can help on any boat. I know from experience that most skippers sit on the windward rail and don�t move around too much. Therefore, you and the rest of your crewmates must do a lot of the work when it comes to balancing boat trim with weight. 3) Up and down (vertical). Lets look at the factors you must consider when moving your weight in each of these directions. When sailing downwind in breezes, spread your weight to both rails so it�s easier to control athwartships heel. Keep your weight far enough aft so your bow doesn�t plough. By sailing on the hull�s flatter aft sections, the boat will be more stable and plane or surf more easily. In waves, you can�t ooch (slam your body forward and stop abruptly), but you often have to move your weight fore and aft fairly aggressively to keep the boat sailing on its proper trim. The position of your weight from side to side is critical for turning the boat, achieving the proper amount of helm and for maximizing stability. Since rudder movement causes turbulence and drag, steer the boat as much as possible with weight so your skipper minimizes rudder motion. As you can see from the sidebar, heel makes the boat turn. So you must move your weight back and forth across the boat to induce or reduce heel and thereby help steer the boat. The further you move away from the keel or centerboard, the more of an effect your weight movement will have on the boat. That�s why, on a wavy reach or run, dinghy sailors sometimes sit on opposite rails (instead of in the middle). This way their body movements have more influence on the heel of the boat, which makes it easier to steer up and down the waves with weight. One of the most important reasons for moving weight side to side is maintaining optimum helm. Upwind, every boat has a certain amount of windward helm (roughly 3 to 5 degrees) that produces the best performance. Your job is to move back and forth, as the wind changes, to keep the right feel (the skipper must let you know about this). Downwind, a neutral helm is usually fastest, and this requires precise athwartships weight placement too. Increased stability is another reason for moving side to side. When you�re in overpowered conditions, get your weight as far from the centerline as possible. Go for short bursts of max hiking (e.g. on a one-design, straight legs and arms over your head) at critical times like coming off the starting line. The question of how far to move forward and aft is a matter of sailing the boat on its lines, reducing drag, minimizing pitch and optimizing the amount of helm you have. In general, most boats are designed to be sailed so the knuckle of the bow and the bottom corner of the transom are just kissing the water surface. This gives the boat its most efficient underwater shape. However, other factors sometimes override this. In light air, for example, move farther forward to lift the flatter stern sections out of the water and reduce drag. In heavy air and waves, move aft a little to keep the bow from plowing. Especially when there are waves, the skipper and crew should all be positioned very close together (in the fore-and-aft dimension). This concentration of bodies keeps weight as far as possible from the ends of the boat, which reduces pitching moment. Fore-and-aft weight placement can also have a significant effect on helm. When you want more wind-ward helm, such as in light air, you should move your weight forward. To reduce helm, which is usually desirable in a breeze, move aft. Pitching is also affected greatly by your vertical location in the boat. 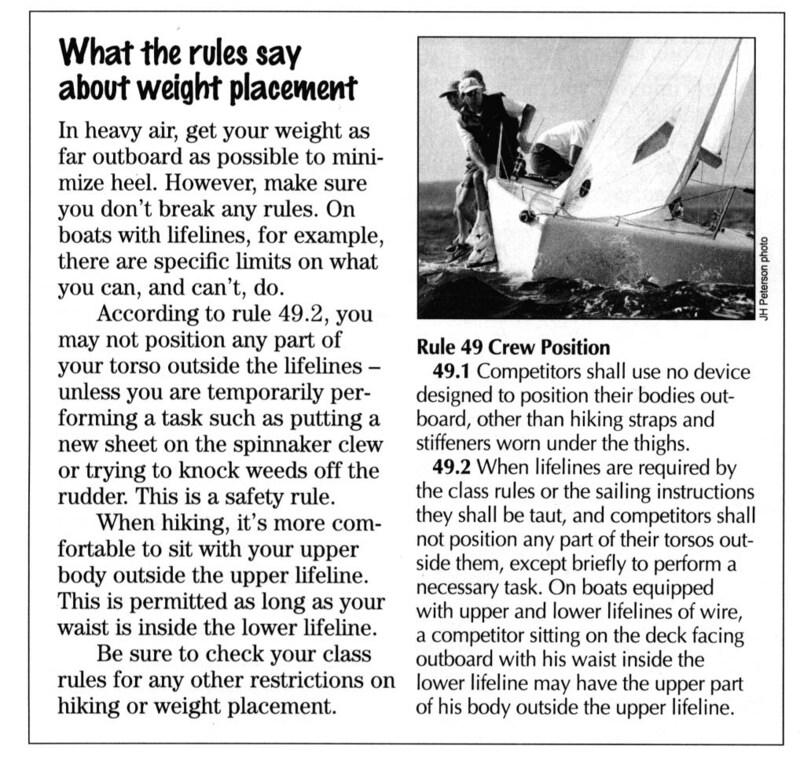 Consider how hard some sailors work to get ounces of weight out of the mast. They know that if you concentrate weight down low, you will reduce pitching in a seaway. It works the same way with crew weight. It you sail upwind in waves with all your crew sitting on top of the cabin, your boat will hobby-horse a lot, and you�ll be slow compared to a boat with everyone lying on the cabin floor. So keep your weight as low as possible in waves. If you like, bring a book, some cookies or any other entertainment for those extended light-air spells down below.